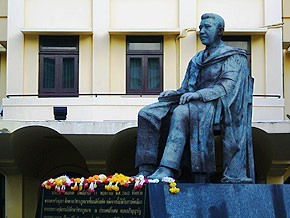 Thammasat University is the fruit of the Siamese Revolution in 1932. The University was founded on June 27th, 1935. Its establishment constituted the birth of the political studies in Thailand. Thammasat University - which held its iconic name at that time as "The University of Moral and Political Sciences” - designated political science as a core subject for its undergraduates, while the Master of Arts and Doctor of Philosophy degrees had three clearly separated programmes: Political Science, Law, and Economics. In the period following World War II, Thailand was embroiled in a series of political turmoil as well as the vicissitudes of the international politics that directly affected the University. Such challenges necessitated the adjustments of the existing curriculums. Therefore, in 1949, Thammasat enacted a set of regulations that pave the way for sweeping reform. Among other things, these regulations led to the creation of the Faculty of Political Science on June 14, 1949. In the process of curriculums and programmes planning, the dean and the faculty’s committees carefully and comparatively studied many academic programmes abroad, with generous assistances of the scholars and specialists from the Fulbright Foundation of Thailand. In 1955, the Faculty of Political Science formed a Master Degree Programme in Political and Administrative Science, with the academic support from the United States. The Faculty also taught its courses both in Thai and English. Later on, in 1959, the Diplomacy programme was founded, followed by the Public Administration programme and the Political Studies programme. During the decade of 1967-1977, there were several structural adjustments aimmed at fostering better academic specialisation within the Faculty. Eventually, the Faculty of Political Science came to have three primary divisions: the Department of Politics and Government; the Department of Public Administration, and the Department of International Affairs. This rearrangement of the Faculty persists until today. However, the Faculty of Political Science constantly strives to reinvent and adapt relentlessly in order to be able to cope with the transition of the global contexts as well as new developments and situations. Academically, in the early 1990s, notwithstanding countless partnerships with other universities both in Thailand and abroad, the Faculty also started other three special programmes for the Master Degree studies: the Master of Political Science Executive Program in Public Administration and Public Affairs (EPA), the Master of Arts Program in Politics and Government for Executives (MPE), and the Master of Political Science Program in International Relations (MIR), which is taught in English. After many years of intense preparation, recently in 2009, the Faculty reaffirmed its leading role in Thai Academia as the first Political Science institute in Thailand that starts an English programme for politics and international relations. This programme, the Combined Bachelor and Master of Political Science Programme in Politics and International Relations (BMIR), would greatly bolster the reputation of Faculty as well as its crucial role as an international academic institute. The programme is now thriving fruitfully with the leaping increment of academic contracts from other Thai universities, as well as international students and researchers.